Every kid who saw the crime-fighting hero Batman on television or at the movies grew up wishing they had the comic book character’s cool-looking Batsuit, a jet engine Batmobile, and a secret lair like the Batcave. But as we get older, the envy expands to include the stylish, elegant lifestyle he lives in between the bad-guy beat-downs, as his true identity Bruce Wayne. Michael Keaton, Val Kilmer, and George Clooney played him as the type of guy who would wear turtlenecks. Such is not the case with the latest incarnation of the character, as played by Ben Affleck in Dawn Of Justice. He’s a bolder and more imposing gentleman, who woos women with Chateau Margaux when he’s not driving to black-tie affairs in his other car, a 1957 Aston Martin. And even when he’s not wearing a black carbon fiber suit outfitted with serrated blades, he’s still always dressed to kill. “This is not the kind of guy who is swayed by fashion trends. You’re not going to catch Bruce Wayne in skinny jeans. Everything about his look is timeless,” says the film’s costume designer Michael Wilkinson. From the very first scene, when Wayne hops out of a private helicopter and into a blacked-out Jeep Renegade wearing a tailored Gucci blue wool vest, we know that even if this man can’t save the world, he’s going to look good trying. We got some style tips from the man who created the superhero’s look, both day and night. Wilkinson and his team created a whole new fabric for Batman’s body armor so that they show off Affleck’s musculature in a way similar to the Frank Miller drawings. The same attention was paid to the threads of his made-to-measure Gucci suits. “Bruce Wayne would only be wearing the highest quality.” Contrasting textures were achieved by matching his wool suits with silk pocket squares and knit ties. When you’re trying to lead a lifestyle like Bruce Wayne’s, you don’t have time to shop new designers. It’s all about finding a tailor who you love and doing some necessary delegation. Especially when you’re spending long hours training in the Batcave. “Ben’s body was changing day-to-day, his measurements were constantly getting bigger, so some of the suits were getting adjusted constantly.” Due to his imposing frame, they stuck with wider and bolder details on the coats, like a peak lapel. “If he’s going to a big soiree, Bruce Wayne is going to be wearing something no one else in that room would,” Wilkinson says. This was the thought process when he put together the tuxedo look for his second encounter with Wonder Woman. “We felt that we should use a special fabric, so we went with a midnight blue velvet.” If you’re going “designer” for the suit, don’t be afraid of adding a unique piece to give the look an edge. The bow tie was a special find in a vintage store in Los Angeles. Later, when he returns back to the Batcave to do a little research, he ditches the jacket and rolls up the sleeves of his Tom Ford dress shirt, showing that it doesn’t hurt when your tuxedo whites can stand on their own. It’s all about the silhouette when you’re considering the right overcoat. Whether you’re confronting an evildoer in a dark alley or having a romantic rendezvous, do you want your shadow to cast some cinched-waist figure, or do you want to project a shape of strength and power? The choice of wool twill creates a timeless feel to the Gucci-made coats, matching their more boxed structure, for a look reminiscent of the classic 1940s cut. Wilkinson designed a full array of metal accessories in more military-themed brushed gunmetal for a more intimidating look. Adding a collar bar to your suit will do nothing but elevate the overall esthetic. And for that added sense of individualism, nothing works better than an elegant monogram. You may see a number of “BW”s peppering Wayne’s wardrobe. 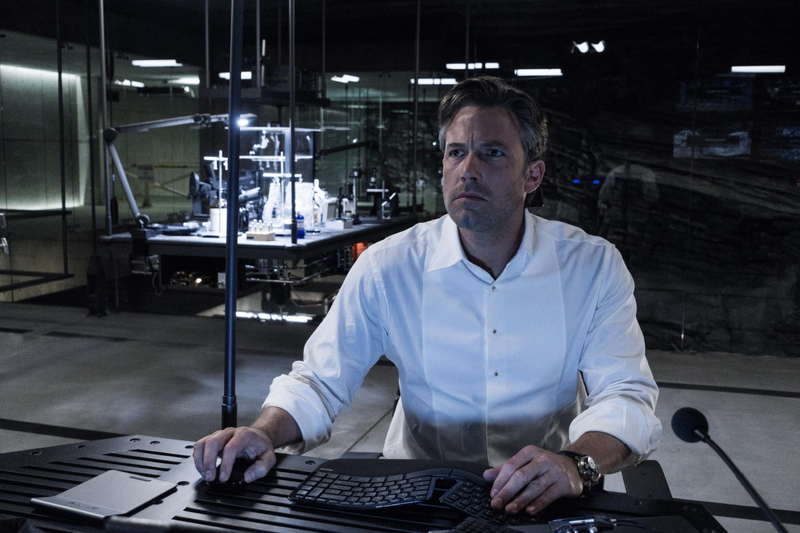 Bruce Wayne knows that nobody looks good in a suit without spending a little time in the gym. For the training scenes, which included heavy lifting, weighted pull-ups and sledgehammer training, he wears gear from Under Armour. “When not in a suit, and off-duty, he’s not the kind of guy who is going to over-dress at home,” Wilkinson says. “It’s all about having high-quality standards that you can keep in the closet and pull out without a second thought. This is more of an everyman kind of dresser.” Kicking it around the manor, Wayne wore denim shirts by Ralph Lauren and Rag & Bone jeans in a classic cut. His choice of sneaker is leather Converse high-tops when working on the Batmobile, in his favorite color of course.